Background: Har Homa (in Hebrew) and Jabal Abu Ghaneim (in Arabic) – a tree-covered mountain between Jerusalem and Bethlehem and the site of angry protest, as Israeli settlers sought to build homes on it. Peace activists tried to make that hard for them. The protests continued for months, but the politics of settlement combined with greedy contractors ultimately carried the day. These last few weeks have been full of grassroots activism – people on the streets. I won’t give you a blow by blow, but just a sample of today and tomorrow. The morning began with a march to Jabal Abu Ghaneim (Har Homa) – about 3,000 Palestinians joined by about 50 Israelis, organized by the Bet Sahur/Israeli Rapprochement group. It was peaceful, even pastoral, like a camp outing, chanting and all. The banners read: “Palestinians walk for peace”, “Goodwill on earth”, and other pacific slogans; Faisal Husseini was equally dignified in his call for nonviolent protest. Palestinian police held back a few who tried to break ranks and run toward the Israeli soldiers. And we handed out flyers, reprinted below. B’Tselem, the human rights organization, has demanded prosecution of the soldiers and a halt to the use of undercover agents in civilian populations. B’Tselem notes that since the beginning of the Intifada, Israeli undercover units have killed 159 Palestinians, among them 19 children. Since the Oslo Declaration of Principles (September 1993), undercover soldiers have killed 30 Palestinians. And the tragic irony to the story. At the time of the incident in the village, al-Hilu’s son Abed was not around. The young man was in Jerusalem, participating in a peace-through-dialogue group with Israeli students from Hebrew University. Peace Now has organized a march of torches for tomorrow evening near Jabal Abu Ghaneim (Har Homa). Ugh, I hate that hot wax dripping onto my hands and sleeves, but the procession always looks impressive on camera. Thousands of Israelis are expected to show up and get wax on their sleeves tomorrow. And finally, Saturday ends with a movie for peace. Bat Shalom is running a benefit performance of “Antonia’s Line” at the Jerusalem Cinematheque, preceded by a reception with women Knesset Members. I wish more of you could join us for this and the other events. § Israel continues to be in sole control of 78% of the West Bank and 44% of the Gaza Strip. This is true even though Jewish settlers comprise only 6% of the population of the territories. § Israel continues to confiscate thousands of acres from the Palestinians in order to expand settlements and build bypass roads to them. Har Homa is only one such example. Not only is this a violation of international law, but creating “facts on the ground” pre-empts any good faith negotiation with the Palestinians in the final status talks. § Since March 1993, closure has never fully been lifted, although there are periods during which it is eased. Closure plays havoc with the Palestinian economy, which is dependent upon Palestinian workers entering Israel. § Approximately 29% of the Palestinian labor force in the territories is unemployed. During closure, unemployment soars to 50% in the West Bank and an astounding 70% in Gaza. § The Palestinian economy has sharply deteriorated since the Oslo Agreement. Between 1992 and 1996, the real per capita GNP in the Palestinian territories plunged by almost 40%, from $2400 to $1500 per annum. § Most damaging has been the “internal closure” in which Palestinians are not allowed to leave their towns or villages. This has a devastating effect on access to health services, schools, food products, and commerce. § Thousands of Palestinian students cannot attend university because of Israel’s failure to comply with the Oslo agreement to provide passage between the West Bank and Gaza. Some of these students have also been subjected to pressure by the Israeli security forces to become collaborators. § House demolitions continue to take place in the territories, sometimes as a punitive measure against the families of suspected terrorists, sometimes to pressure the inhabitants to emigrate, and sometimes to prevent Palestinian economic development (especially in East Jerusalem). In recent days, demolition orders were issued by the Israeli authorities against approximately 1,000 more Palestinian homes, which will leave thousands of innocent persons, many of them children and old folks, without a roof over their heads. § The Oslo Agreements give Israel far-reaching control over the autonomous areas of the Palestinian Authority – control over access by land, sea and air; veto power over bills in the Palestinian Legislative Assembly; and the right to enter any part of the autonomy at will for what Israel deems to be its security needs. The three major peace movements – Bat Shalom, Gush Shalom, and Peace Now – have been paying regular visits to the mountain, with signs like “the bulldozers are destroying the peace”, “Har Homa is an obstacle to peace”, etc. But the army has tightened its grip on the mountain in a wide, armed belt, no longer allowing Israelis or Palestinians to get anywhere in sight of the bulldozers. They even surrounded and laid siege to a small “tent city” of Faisal Husseini, senior Palestinian official for Jerusalem, forcing him and some others to abandon the tents and return to diplomatic channels. That’s why I think we can be proud of a group from Bat Shalom for managing to infiltrate the area yesterday, getting past army barriers by various ploys, with the imaginative cooperation of our Palestinian minibus driver, Abu-Salim. At one barrier, we posed as Palestinian women on our way to visit friends in the village of Qatir; at another, we played the role of religious Jewish women on our way to the settlement of Tekoa; and at a third, we were American tourists. At each, we held our breath as the driver and one other woman – in the appropriate language – advanced the argument. Abu Salim lives in Qatir and knows the mountain backroads. With a sure hand, he drove us right onto the low valley road where 100 soldiers were guarding bulldozers shoring up the land on each side of them. Our small group got out, walked about 60 feet (20 meters) toward the bulldozers, and began to construct the tent that we had brought with us. It took the soldiers about 15 seconds to reach us, and demand to know what we were doing. “Building a tent” seemed obvious, but we said it. “What tent?” “A women’s peace tent,” we explained, “to protest the activities of the government on the mountain.” By then the major media had run over and began filming the scene – women setting up the tent, arguing with the commanding officer, and exhibiting peace posters: “Women Protest Har Homa”. “You have 5 minutes to speak your piece to the cameras,” said the commander, unable to stop the cameras from rolling, “and then beat it.” Well, it was closer to 45 minutes, and we did speak our piece to all the major media from Israel and elsewhere. It was worth the $350 for the tent to get all that media. From there, we headed (with Abu-Salim’s superb navigation and elusive driving) toward Faisal’s tent. On the way, we picked up Kawther Salam, a Palestinian woman journalist whom we knew from previous peace actions in Hebron. Kawther was walking through the mountains to evade the soldiers and get her story. It was like a family reunion when she boarded the bus and discovered her sisters in peace on it! After several more army barriers, we reached a point about 600 feet (200 meters) below Faisal’s tent, but the bus could not plow through the mud any longer, so we got out and walked. Just as we were about halfway up and climbing a very sharp incline, a troop of soldiers descended toward us with their guns ready. “This is a closed military area,” declared the commanding officer. “Yes, but we have an invitation to drink coffee with our friends over there,” we explained. He was not persuaded. “Show us the order,” asked one of the women, and he went off to find it. By then, and completely uncoordinated with us, a small group of Christian Peacemakers appeared coming up another path, and the soldiers ran off to stop their approach. This, of course, allowed us to inch our way forward, thanks to the unplanned diversionary tactic. By now we were shouting distance from Faisal’s encampment, and they came around the tents to see what was going on. Then we saw that the army had set up a fence to keep them in and keep others out! The Palestinians and we could only signal to each other, but the media were allowed through, and soon enough we were again facing a battery of cameras, explaining our point of view to the international and the local community. And the cameras loved the pictures of throwing kisses, the V sign for victory, and peace slogans back and forth over the heads of the frustrated soldiers who could do nothing to stop the hope for peace from criss-crossing right past their guns. That’s all about yesterday. We did not manage to get through, but we did get great publicity for our point of view. I know this is going to be “another Har Homa story”, but that’s where the action is these days. Although it’s easy to tire of this tale (the media have relegated it to page zillion by now), the Israeli government is still enormously sensitive to the issue, and it’s important to keep up the pressure, to prevent them from creating other settlements. Since the bulldozers began scarring the land at Jabal Abu Ghaneim [Har Homa], a tiny tent city of about a dozen tents has sprung up on the hillside opposite. For the last couple weeks, hundreds of Palestinians and Israelis have come to this site every day (and some have slept there) to protest, express solidarity, and make it clear to one another that this is a struggle that we share. Neither side can do it alone. Yesterday, thanks to the wonderful organizing of Rapprochement – a joint Israeli-Palestinian dialogue group that has persisted through the past 9 years – hundreds of children, women, and men from many Israeli and Palestinian peace organizations came together on the hillside to call for the bulldozers to stop. The media were there and the speeches were moving: Representatives of a dozen organizations spoke eloquently about ending the bloodshed, creating a Palestinian state, sharing Jerusalem as a capital, finding a way to live together cooperatively on this land cherished by both peoples. Their words seemed so clear and compelling as they carried across the valley, a reflection of the spring flowers pushing their way out of the rocky terrain around us. But perhaps the most encouraging part was the children. The organizers had set up swings and slides, and set mattresses down so the children would have softer landings. Soon they were playing hide-’n-seek together (“Mommy, count to 10 in Arabic for me”; “Daddy, tell him in Hebrew that it’s his turn to hide”). Then it was time to draw pictures of the landscape, and suddenly 50 portraits appeared of the blue skies and green covered hill opposite. The children posed as a group holding their crayoned drawings out in front of them, as the media caught their hopeful perceptions, eclipsing for a moment the harsher political reality behind them. We adults settled into comfortable conversations, enjoying the balmy weather, the repertoire of a Palestinian children’s folk dance troupe, camaraderie, and a break from the intensity. I heard some “un-organized” singing at a distance and went to observe. It was a group of Israeli and Palestinian children, perhaps 8 to 10 years old, sitting on the ground completely mixed up with one another, trying to sing “Heveinu Shalom Aleikhem” together, which the Palestinian children rendered as “Shalom Aleifa”. The Hebrew words literally mean “we bring peace to you”; in Israel, the intent is “welcome”. When that was over, the Palestinian children sang with gusto “Biladi” – “my country” – which has spontaneously become the national anthem of the Palestinians. These children will grow into adulthood creating their own state. It reminded me of the fervor of the Jewish children who helped create their own state of Israel. Too much fervor on both sides to ever extinguish, I thought to myself. The afternoon continued at that shifting pace – fervor alternating with tranquillity – and then two small groups of women separated themselves – Israelis from Bat Shalom and Palestinians from the adjoining village of Beit Sahur. Together we formed a joint delegation to pay a condolence call at the home of the Salah family, whose son Abdallah had been killed last Saturday by Israeli cross-fire in the territories. We filed into the room and each woman, in turn, spoke a few quiet words to the mother who sat stonily in the corner. We took seats around the room – by then we were perhaps 40 women there – and some of the Palestinian women began to weep. One of them said that the grandparents of the boy were refugees of 1948. A man came in and stood at the doorway. “I am the father of Abdallah, the martyr,” he announced in fluent Hebrew. “My son, the student,” he added. He then made a speech that sounded – and he said it was – rehearsed repeatedly in the media over the past five days: “My son was never in trouble with the army a single day of his life. He was a good student and going to be an engineer. The floor I built over our heads was for him when he would get married.” It was a moving eulogy, spoken with much love and tears. Speaking for the women from Bat Shalom, I said a few words about the sorrow we felt over Abdallah’s death, and our prayers that there would be no more violence and bloodshed. That opened a flood of wrath from the mother. “Where are the Israelis when my boy is killed? Where is the world? Why did King Hussein get down on his knees to ask forgiveness in Israel, but Netanyahu does nothing? He is a dog, the son of a dog, and I would kill him with my bare hands, if I could.” We sat and listened to her unanswerable questions, responded when she allowed us, listened to her unquenchable fury, offered her words and tears, heard her rage, and one of the Israeli women kept her hand on her arm throughout. The mother would not cry among us, as the father had let himself do. When she drew to an end, the women stood up. “May Allah have mercy on his soul,” we each said as we embraced her before parting. As we left the home, each of us was handed a glossy picture of Abdullah: a skinny, serious-looking 21-year-old. He looked like he would have made a fine engineer. 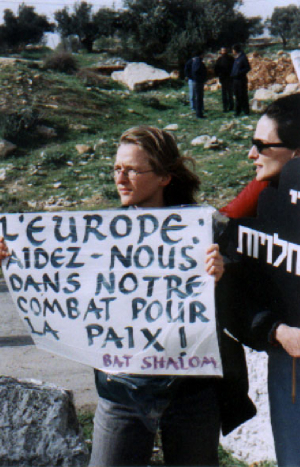 Background: The Israeli and Palestinian women of the Jerusalem Link ran a major national campaign on both sides in 1997, advocating the “sharing” of Jerusalem as the capital of both states. This was a position considered taboo by both sides at that time, and is not much more popular today. The culmination of this campaign was a joint march through the streets of East and West Jerusalem, which was supposed to be followed by a huge outdoor concert in which famed singer Sinead O’Connor had agreed to appear. Several days before the concert, O’Connor cancelled her trip, citing telephone threats from the extreme right. Nothing we could do or say convinced her to come. The march was a success, but the concert never happened. Sharing Jerusalem: After listening frustrated to all that rhetoric saying that Jerusalem belongs “only to Israel” or “only to Palestine” or that Jerusalem was “an insoluble issue” or “the stumbling block to peace”, we had been hungering to make our views heard on this subject. Our opportunity came this afternoon, several hours ago, when 5,000 Israelis and Palestinians turned out, joining hands and hearts, to say out loud that the time has come to Share Jerusalem. The Israeli and Palestinian women of the Jerusalem Link began planning this months ago. We knew that the planning process had to model the very peace that we were seeking – negotiating in mutual respect – and that the product had to reflect the principle of parity and the multi-culturalism of our city. It has not been a simple process, but today we saw the culmination of many difficult meetings. We gathered in the amphitheater at the entrance to Damascus Gate, beside the wall of the Old City of Jerusalem, the heart of this troubled city. Israelis came from all over the country, north and south, and Palestinians from everywhere, but especially from Jerusalem. The speakers alternated between Israeli and Palestinian women. And the common theme was that Jerusalem has been shared in the past – Jews, Muslims and Christians have lived amicably in this city for centuries – and that we can do it again. That there is no reason for either side to dominate the other. Only once were the speeches interrupted, when the Palestinian shebab [young men] unfurled a Palestinian flag – banned in Jerusalem – and riot troops waded into the crowd and tried to arrest them. Israeli and Palestinian men and women closed ranks and refused to relinquish the young men to the police. Faced with the large and unified group of resisters, the police were forced to extricate themselves from the crowd and leave empty handed. And when the speeches were over, dozens of white doves were released into the air and soared to freedom, bearing the hopes of all those gathered. Then we began the march through the streets of Jerusalem. People held aloft their encouraging signs: “One Jerusalem Shared by Two Nations”; “Jerusalem, the Capital of Two States”; and “Israel and Palestine – Two States for Two Nations”. Some people linked hands, others held aloft the black cardboard “hands” of Women in Black with the simple words “Stop the Occupation”, some chanted peace slogans and others walked in silence. I looked around and saw activists of the past 30 years, each of whom had found a personal way to express a longing for peace. Amira, an Israeli journalist who moved into a Palestinian neighborhood in the territories and files reports about the price of living under occupation. Atar, who had co-founded an organization of psychologists to examine what role they play in supporting the oppression. Claude, an architect, who put an ad in the paper that he would not accept any jobs to design homes in the territories. 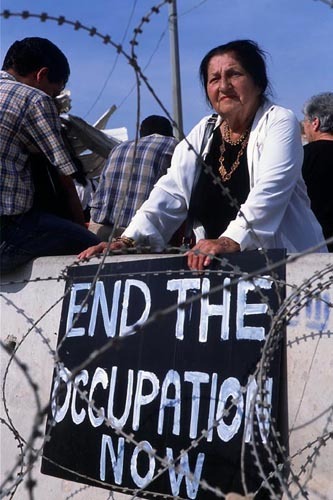 Lily, who began dialogue groups between women from her kibbutz and the occupied city of Jenin. Michael, who runs an “alternative information center”, bringing information out of the territories that otherwise would not have made it. Hava, who organized support visits to Palestinian women political prisoners. Leah, a lawyer who defends Palestinian political prisoners often at little or no fee. Ilana and Rolly, who wrote a book about Israeli soldiers carrying out the occupation. Yishai and Yossi and many young men who sat in jail rather than serve in the army in the territories. And all the many Palestinians, whose work I do not know personally, who have also stood on vigils and demonstrations, written letters or articles, stood their ground and gone to jail, or taught their children about injustice, and sometimes all of these things together, year after year after year, to end the oppression of one people by another. To make the statement that, after all the blood has been shed, the time has come to share the land. And that begins in Jerusalem. Walking through the streets of East and West Jerusalem this afternoon, through the Arab and Jewish parts of town, I felt inspired at the sight of all these dedicated people. I think we all felt inspired to see each other. Only a few people have spoken out about this solution for Jerusalem – sharing it – but this large group had the courage today to say it out loud, and those on both sides who love peace, once again let their defiant spirit rise above the din of narrow rhetoric. Today the quiet words could clearly be heard: Sharing Jerusalem. This march was a good beginning. The left in Israel is coalescing against the government’s policies, making its voice heard on behalf of peace. A gathering in Tel-Aviv two weeks ago, intended to be a memorial for Yitzhak Rabin, turned into a massive rally on behalf of peace. Perhaps those of you abroad did not blink to hear that 200,000 Israelis turned out to demonstrate; let me point out that this constitutes 3.4% of the country. For those still unimpressed, consider that this is the equivalent in the United States of 8.6 million people going to a demonstration: Picture to yourself an 8.6 Million Person March. That’s a lot of attitude. the peace process until peace is achieved. Join us! Following the vigil locations were the names of the groups who organized them: Bat Shalom, Mothers and Women for Peace, Peace Circles, Religious Women for the Sanctity of Life, TANDI, Women in Black, and Women’s Forum for Peace in Haifa. Ataf Ilayan is a Palestinian woman who is a member of the Islamic Jihad. When Palestinian prisoners were released as part of the Oslo Accords, Ilayan also went home. She was free until one month ago when Israeli police boarded a bus in a Palestinian- controlled area and re-arrested her, placing her in “administrative detention” – arrest without trial. Ilayan declared a total hunger strike – no food or water – until Israel releases her. She is now receiving a saline solution. She has left instruction that she be given no other nutrition. Her lawyer stands by her bed and refuses to allow the doctors to force feed her. The newspapers do not carry word of Iliyan’s condition – typical of the press to ignore activities that would undermine the powers-that-be. “Alian...was released from Israeli prison in the framework of international agreements, and her current detention is but an excuse to bypass these agreements and return her to jail. “In the name of justice, Bat Shalom demands that the government of Israel and the Chief Prosecutor of the I.D.F. immediately release Ataf Alian or, alternatively, bring charges against her and enable her to defend herself in an open court in keeping with due process. He was 7 and a half years old and had the misfortune to have been born into a war zone – Bethlehem. ’Ali Jawarish was with his cousins buying pencils for school when some bigger kids began throwing stones at Israeli soldiers posted nearby to safeguard Jewish worshipers at Rachel’s tomb. In response, one soldier kneeled, aimed, and fired a bullet into Ali’s head. The cradle of the three “great monotheistic” religious around the corner was no help. By the time his parents reached the hospital, ‘Ali was dead. The doctors were sustaining him on life-support systems and asked gently if they could remove the organs for transplant purposes. “I didn’t want them to cut open his small body and hurt him all over again,” said the mother to a group of Bat Shalom women who came to pay a condolence call, “but I said they could.” She shrugged. We were sitting on stools around a dismally poor room, other children on laps and underfoot, and one sleeping on a mattress in the corner. Yally, one of the women, enchanted the young ones with finger puppets, while we exchanged words of sympathy with the mother. Other Palestinian women crowded into the room expressed their anger at the Israeli army, the government, the situation. We could only agree. “They gave his organs to three children,” continued Mrs. Jawarish staring off. “I said it was okay if they were Jewish – all children are innocent. In a way I lost one child, but now I have three new children.” It sounded like something she heard and was repeating. We left the home and walked the alley back to the street. The walls were covered with graffiti and one picture of ‘Ali reproduced dozens of times – a slight, worried-looking boy with a cowlick in an oversized plaid shirt, his hands barely out of the sleeves to fit into trouser pockets. “If you kill one child, ten children instead will be born,” said the printing over the picture. So ‘Ali’s death gave life to 13 more: the 10 who will be born and the three who now have his heart, lungs, and kidneys. You may recall the story of 7 year-old Ali Jawarish, killed when he was caught in the crossfire of Israeli soldiers as he was out buying pencils for school. I wrote one month ago that women from Bat Shalom had paid a condolence call to Ali’s family in Bethlehem. Especially poignant was that Ali’s parents had agreed to donate their son’s organs to Israeli children in need. Three children have a new lease on life as a result of his parents’ generosity of spirit, despite their grief. I am writing today because the Knesset is about to pass a law that would virtually pardon the Israeli authorities for having brought death to Ali and 1,345 other Palestinians (276 of them children) since the beginning of the intifada, and to the many thousands of others who were injured. This is the so-called Compensations Bill. The Compensations Bill denies compensation to Palestinians injured by Israeli security forces in the Occupied Territories on the grounds that the Israeli forces stationed there were engaged in “combatant activity”. This protects them from civil damage suits. If this law passes, civilians who were negligently maimed, either in the past or the future, will not receive money for medical care, nor will the families of those killed be allowed to sue in civil courts. Even scarier, Israeli forces will hear the message that they will not be held accountable for future human rights violations of this nature in the Occupied Territories. Although many human rights organizations around the world (and a coalition of seven in Israel) have vehemently protested the bill, the Knesset is likely to pass it because of the money it would save the government. Indeed, many members of the Labor Party are supporters of the bill, including Ehud Barak. What can you do? Pressure from individuals – inside and outside Israel – is often a significant factor. If you would take a minute to write a brief fax, or use the example below, we believe the Knesset would ease the terms of this brutal legislation. Ali’s parents deserve a better response from the Israeli government to the killing of their son.